Erase & Renew Double Cleansing System Is Zoe’s New Love! Are you happy cleansing your face just once at night? Zoe Newlove shares her skincare mantra – Double Cleansing! Make-up artist and beauty blogger Zoe Newlove’s blog is full of her own experiences in the world of beauty. 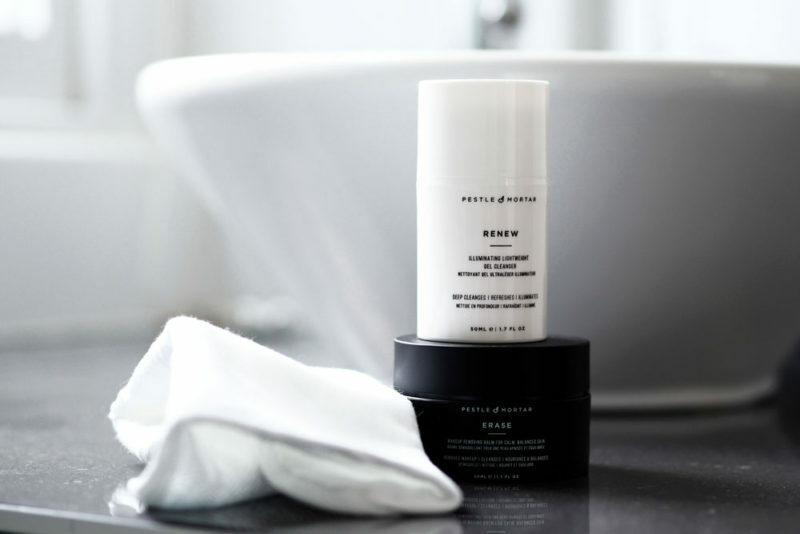 Here’s her review of Pestle & Mortar’s Double Cleansing System and what she loves about it! For me, ever since I first started wearing make-up, a good ten years ago or so, I always wanted to make sure I took it off properly. The idea of sleeping in my make-up was & still is, really wrong. I have never found washing my face once to ever be enough! So I was pretty excited about this Pestle and Mortar Double Cleansing system. The first step is a make-up removing balm, which you apply to your skin when it is dry. This literally melts into your skin, and as you massage it in, it breaks down all the dirt that has built up on your face throughout the day. I really enjoyed using this as my first step, it did not feel too heavy and left my skin nice and clean! Now I really, really like this cleanser. The texture is again lightweight and is a really soft, gentle gel cleanser. When I first used this, and when I looked in the mirror, I was so happy to see how fresh and radiant my skin appeared! I have since of course read that it contains papaya and mango fruit enzymes which help improve the skin’s texture and tone, whilst tightening pores to give you that glowing complexion. So what are My Thoughts about This Double Cleansing System? I was really impressed overall. I would definitely recommend this and will continue using this pair in my skincare routine for the foreseeable future! ← It’s Double Cleansing All the Way for Sandra of The Black Pearl Blog!